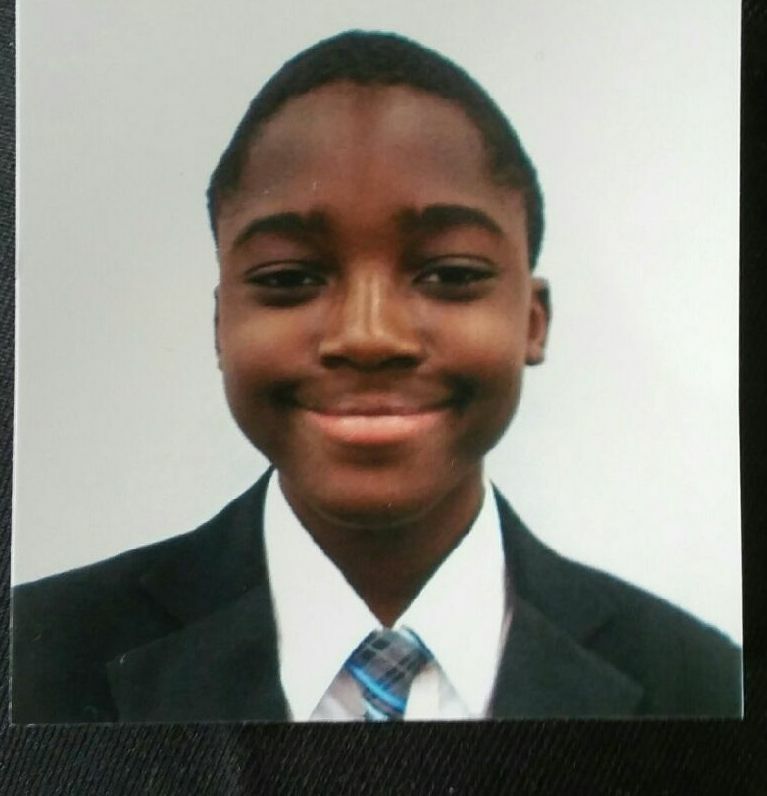 Melvin Chartei Aborbie, age 12. Sunrise July 12, 2006 and Sunset July 25, 2018. Visitation 9:00am and Funeral 10:00am Saturday August 4, 2018 Ramseyer Presbyterian Church 3228 Westerville Rd. Please accept our condolences and prayers for your family loss. May the support of family and friends be a source of strength and the God of comfort a refuge in your time of need. Thoughts of peace. Our condolences in your great loss. May the Spirit of God Speak on your behalf when words simply won’t come. May he grant you comfort and healing. Ours prayers are with you. My heartfelt condolences to you and your family in the loss of your sweet child. I hope for nothing but healing and peace. Our family have held you all in our prayers. May you find comfort in God’s love. I know you have a hole in your heart that will never be filled. May beautiful memories be a comfort. You have been in our prayers since this terrible tragedy. May our God hold you in the Palm of His hand and carry you next to His heart until you meet your precious Melvin again. Prayers for comfort and peace at this time. Take refuge in God.Psalm 34:18-The Lord is close to the brokenhearted and saves those who are crushed in spirit. Please accept our sincere condolences. Praying that God gives you the strength and comfort as you celebrate the life of Melvin. I am truely sorry for your loss! May you find strength in Christ. God Bless you and your family! Our hearts are grieving with you. No one can know the depth of loss you are feeling and how empty your life seems, but our Heavenly Father is holding Melvin in His arms for eternity. His love comforts and sustains us in times of pain and suffering. Our love and blessings come from Him. Pray you be in the peace and joy that overcomes anything. Our family and our church are praying for your peace and comfort. May God bless you and keep you, now and always. Our families deepest sympathy to your family. May God bring you peace and comfort from all of your loved ones. Our hearts ache with yours. We were so sorry to hear about your tragic loss! We are praying for you all as you ! As you go through this deep valley of grief know that God is with you during this difficult time in your journey! My deepest and heartfelt sympathies to the family of this young man. I can not imagine any greater anguish then the loss of a young child. I will continue too keep all of you in my prayers and hope that God wraps you all in his arms and rocks you tenderly to a peaceful place . We heard of the death of your son on Sunday. Please know that the people of Discover Christian Church are praying for your family during this time of grief and loss. You have our deepest sympathy. I did not know your precious boy, but as another mother of a child who has died I know that your suffering is terrible over this loss. Your son looks to be such a fine young man, I am sorry for your loss. There are no words. All seem empty, but our God is a God of comfort. He is with you and will see you through. Praying for you. The AOCI Recovery Services team wants to send our sincerest condolences for the loss of your child. From our correctional family to yours, we pray that God’s grace will help you through your journey of grief. We are so sorry to hear of your devastating loss. As parents, it would be incredibly difficult to ever wrap your mind, heart and emotions around this shocking loss. Please accept my heartfelt condolences for the loss of dear Melvin. May GOD comfort you all now and in the difficult times to come and may He heal your broken hearts. Ps. 147:3. Oh my heart. We lost our oldest son just before his 14th birthday, eight years ago this past week. We hope you find peace from your grief and loss in time. All the hugs for you all. I want to send my deepest condolences to your family. I will be praying for your heavy hearts at this time and for the difficult days to come. God is here and he loves you and Melvin always. He is with God and God is with you! I would like to express my deepest condolences to Melvin’s family and friends. We have had you in our hearts and have continued to pray many prayers on behalf of your family at this very sad time. May you hold close the wonderful joy that Melvin was to each of you, and may those beautiful memories flood your hearts in these most difficult days and in the days ahead. The hope of heaven is real and Melvin rests in the loving arms of Jesus. May you find comfort in knowing that many people are praying for you. I’m praying for you and your family, my heart and soul aches for you all, I’m so very sorry to hear about the loss of your son Melvin, God be with you at this time of sorrow. We would like to offer our deepest condolences in your great time of sorrow. Our hearts break for you. Melvin was a household name at our house. Our son Quinn was very close with Melvin at school. Every night it seemed Quinn had the most humorous story from the day that he shared with Melvin. Quinn is missing him so deeply and sincerely. He describes Melvin as “perfect”. It’s hard to understand why his perfection was taken from all of us here on earth so soon. His soul now lives in the land of perfection. We are praying for you! Please know that we are continually praying for your family. God bless you and hold you warmly in His hands. We are far, but in Christ, feel very close to you. I am lifting you all up in prayer, that God grants you peace that surpasses all understanding . . . in Jesus’ name. So sorry for your loss. God bless and keep you. We are so sorry to hear about your loss. Please remember that the community is praying for you at this difficult time. We pray you find comfort in the God you know, and your family and friends.